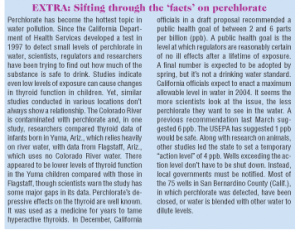 Summary: Fearful of human health risks, perchlorate has been studied by many organizations, including the AWWA, in recent years. As the volatile chemical’s presence in ground and surface water gained greater awareness, particularly near military installations, water treatment dealers sought treatment solutions. Factors to be considered are discussed here. Perchlorate (ClO4-) is a contaminant found in the environment as the salts of ammonium, potassium or sodium perchlorate. Ammonium perchlorate is used in fuel propellants for rockets, missiles and fireworks. Due to its limited shelf life, large volumes of perchlorate have been disposed of and replaced. Environmental contamination is typically a result of poor handling and disposal practices of the past. 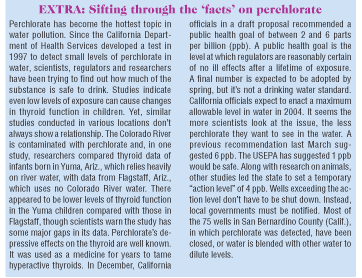 Perchlorate has proven to affect the thyroid gland by interfering with iodide uptake. In adults, the thyroid regulates metabolism and, thus, the chemical’s presence in even very low quantities may cause cancer or Graves’ disease. In children, the thyroid plays a major role in healthy growth, thus it’s feared perchlorate causes developmental problems. Thyroid dysfunction in expectant mothers may lead to delayed development of the newborn as well as decreased learning capability. Changes in thyroid hormone levels may also lead to formation of thyroid gland tumors. It wasn’t until recent years, with vastly improved detection capabilities, that the presence of perchlorate was discovered in many areas, starting near Aerojet General Corp.’s facility near Sacramento, Calif., in 1997. The detection limit of perchlorate for purposes of reporting is 4 parts per billion (ppb). In January 2002, the California Department of Health Services (DHS) lowered its action level from 18 ppb to 4 ppb (see EXTRA). Other states haven’t yet set action levels, primarily because levels higher than 18 ppb haven’t been found in their water supplies. A great amount of research has been funded by the American Water Works Association Research Foundation (AWWARF) regarding perchlorates in drinking water. One such project, The National Assessment of Perchlorate Contamination Occurrence, concluded that perchlorate has been shipped to, or manufactured in, over 190 facilities in at least 39 states (see FYI). This study also found that 170 drinking water sources were within the zone of influence of perchlorate contamination. This zone is defined by the researchers as a four-mile radius for groundwater sources and 15 miles downstream for surface water intakes from the potential point of perchlorate release. Of 160 drinking water samples collected during the assessment, seven (4.4 percent) tested positive for perchlorate. All but one had concentrations below 18 ppb. Due to the unusual nature of perchlorate chemistry, treatment of contamination in water is complicated, and conventional water treatment technologies aren’t always effective. At least three conventional technologies have been studied for possible use in perchlorate abatement. There are several companies offering ion exchange systems that can reduce perchlorate to below 4 ppb. These systems have been tested and/or installed at various locations in the southwestern United States. In February 2000, a major equipment manufacturer received approval from the California Department of Health Services for perchlorate treatment with an ion exchange system. The type of resin used in perchlorate systems varies. The perchlorate anion tightly binds to strongly basic anion (SBA) exchangers, removing the contaminant to remarkably low levels. This strong attraction has its drawbacks. Test results indicate that not all SBA resins loaded with the perchlorate ion can be regenerated efficiently with conventional regenerant chemicals like salt or caustic soda, regardless of the dose. As a result, any regenerable system employing a conventional SBA resin will generate a significant quantity of waste regenerant and likely requires frequent resin replacement. In addition to conventional SBAs, other “selective” ion exchange resins are available, with higher affinities for perchlorate. One of these SBA resins with tributyl amine functionality was recently certified under NSF Standard 61 for potable water municipal installations. In May 2000, the Oak Ridge National Laboratory (ORNL) and the University of Tennessee patented bifunctional anion resins. Because these resins are highly selective for perchlorate, they are even more effective in removing trace quantities of the compound, particularly in the presence of organic matter and/or high concentrations of competing anions. Given the high selectivity of these resins, conventional regeneration is, unfortunately, even less efficient. Innovative regeneration sequences employing different regenerants are being developed to minimize the resin replacement frequency and the amount of secondary waste. Weakly basic anion (WBA) exchangers in the “acid form” can also remove perchlorate and, unlike their strongly basic or selective counterparts, can be regenerated quite efficiently. Unfortunately, the regeneration requires two steps with dilute alkali and acid. In the long run, a system combining both weak and strong basic or selective types may offer significant advantages with respect to resin replacement and waste reduction. The AWWARF funded a study regarding use of granular activated carbon (GAC) to remove perchlorate from groundwater. Due to the results of this study, GAC is being used to remove perchlorate from groundwater at a city water authority in California. Although additional research may be under way, there’s currently little data on activated carbon’s capacity and regeneration efficiency. This treatment technology utilizes microbes to convert perchlorate to a less toxic form. A similar method has been used to treat high levels of perchlorate contamination for many years, but it’s now being considered for water with trace quantities as well. A facility in California tested an anaerobic fluidized bed bioreactor in 1996 and perchlorate levels were reduced from higher than 5,000 ppb to below 400 ppb. The questionable issues with this type of treatment include use of biological processes in potable water applications and its cost efficiency. Other methods under study to remove perchlorate from water include electrochemical, advanced oxidation, ozone and ultraviolet light, etc. Research is still ongoing, however, regarding their efficacy and cost effectiveness as a practical treatment technique. Analytical and physiological data, public opinion and politics will ultimately determine the acceptable concentration of perchlorate in surface/groundwaters. Responsible parties will invariably select the least expensive treatment technology that results in meeting these perchlorate levels. It’s difficult to generalize as to what that treatment technology will be; cost-effectiveness is site specific and treatment technologies and action levels change over time. Given the current climate, ion exchange systems seem to have the upper hand. They aren’t without their problems—such as resin replacement and regenerant waste—but equipment suppliers can now point to a number of operating systems. Granular activated carbon and biological systems offer potential solutions to the ion exchange problems, but include their own set of challenges. To determine the best treatment technology for a specific perchlorate project, a thorough assessment of the project’s objectives and limitations by an experienced water professional is highly recommended. National Assessment of Perchlorate Contamination Occurrence (Project #2508), American Water Works Research Foundation. Cannon, Fred S., and Chongzheng Na, “Perchlorate Removal Using Tailored Granular Activated Carbon and Chemical Regeneration,” Presented at the Perchlorate Workshop of the Pollution Prevention Technology Transfer Conference of the Joint Armed Services, San Antonio, Aug. 23-24, 2000.